This cute story has travelled the world, unlike the main character in it, Chinese Chen – who by the way might not have thought it particularly cute at the time. 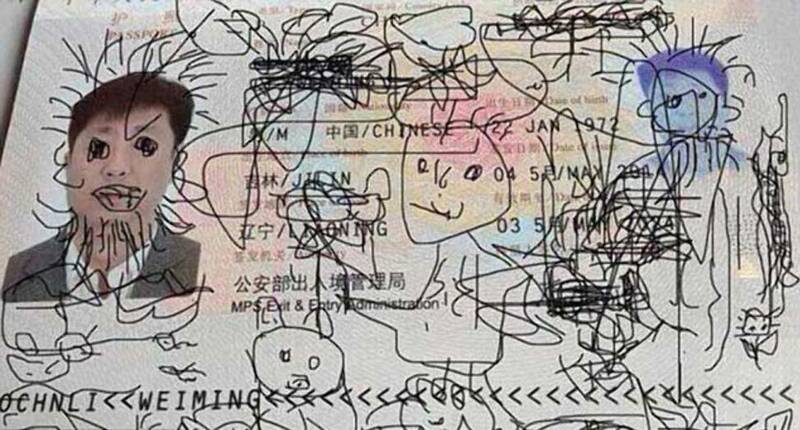 Chen’s four year old son and aspiring artist had followed an artistic whim and embellished his passport, making Chen completely unrecognisable in the process. The local authorities did not see neither the art nor the humour in this, and the immediate result was a prolonged stay in South Korea for Chen and his family, until an emergency passport could be issued by the Chinese embassy. The story doesn’t say if Chen gets to keep the artistic passport as a memento from this particular holiday and as an inspiration for his son in his future art work, and it remains to be seen whether a new art form has been born.